Gosshawk Unlimited recently completed a second Oscar which will become a static display the Museum of Flight. Peter Ruddle updates us on the Oscar project. Bud Anderson is without a doubt one nicest World War Two fighter aces that you can meet. For years Jack Roush operated a P-51D in Anderson’s markings. He recently took delivery of his freshly restored P-51B, now also in Anderson markings. Warbird Digest was on hand when Anderson was introduced to the two aircraft in the air together. Jack Roush’s new P-51B was restored from the remains of a World War Two wreck. Dean Gilmore lost his life in this accident. 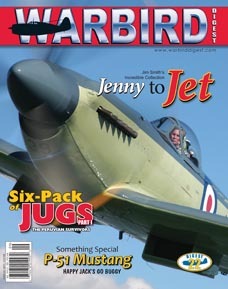 His niece, Karen Gilmore, brings Warbird Digest readers his story, a story that is now permanently linked to the warbird movement. In 1969 Ed Jurist returned a ‘pack’ of Republic P-47 Thunderbolts to the United States. In Part I of this multi-part series, Tim Savage takes a look back at the recovery and the history of two of the Jugs. Scott Thompson discusses this often overlooked film and the prominent role the B-17 played in its production.